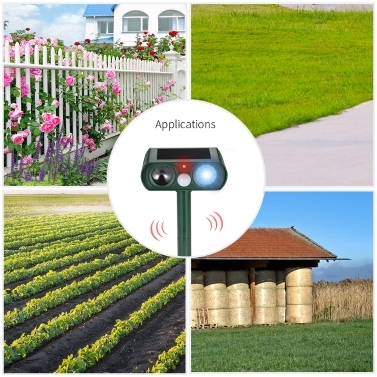 This product adopts passive infrared(PIR) motion sensor to detect the protective area and then emits ultrasonic wave to repel unwelcome animals, such as dogs, cats and birds from your lawns, garden, flower beds, etc. 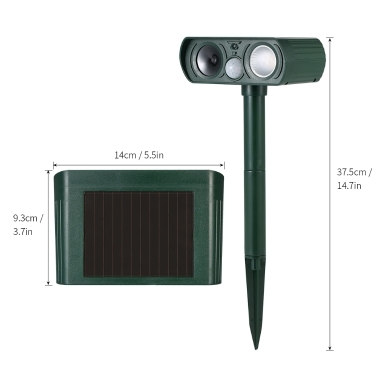 It's used for outdoors. 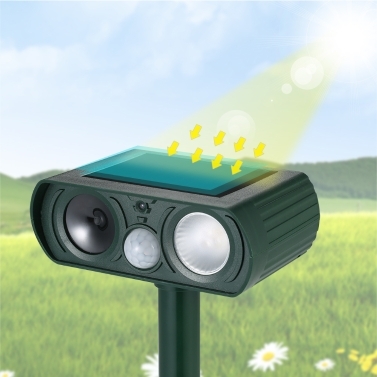 It's environmental-friendly and powered by solar energy, no chemical, safe for humans and pets and won't even harm the pests you are trying to repel. 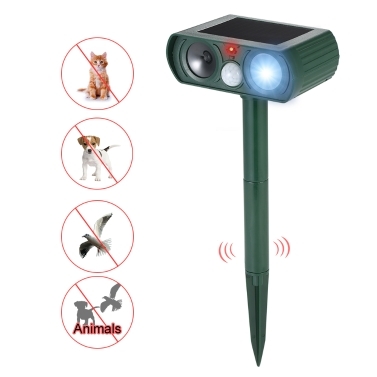 Get Rid of Unwelcome Animals: Eliminate animal problems with this ultrasonic animal repeller. 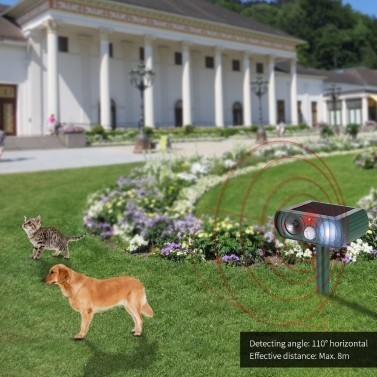 Advanced Design: PIR motion activated then emit ultrasonic wave to repel unwelcome animals. 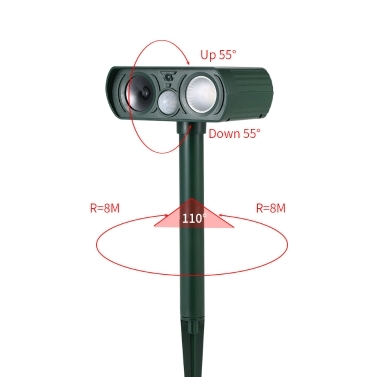 Extended Coverage: Effective distance up to 8 meters with 110 degrees detection angle. Ultrasonic Frequency: 25KHz/34KHz/43KHz/52KHz/61KHz, every frequency band works 2.5s then works cyclically. Safe to Use: No traps, no dead animals, no messy chemicals or pesticides. 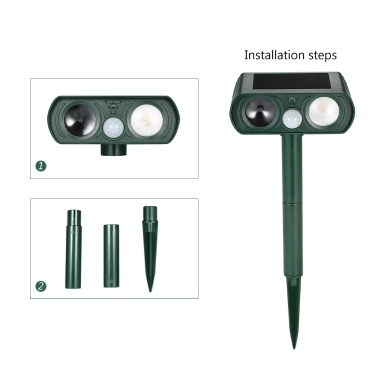 Easy to Install: Select your desired position and insert the spike into the ground. 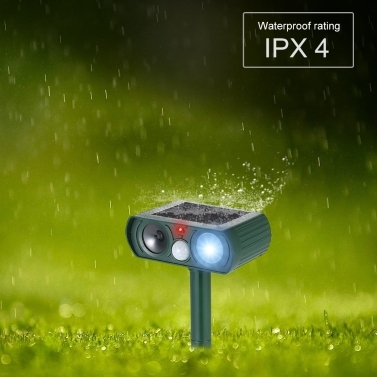 Waterproof with High Quality: With waterproof protection rated IPX4 light casing, no more worry about light rain. 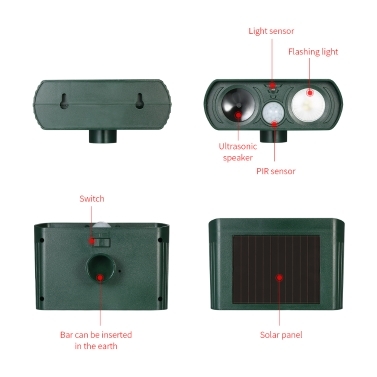 Solar Powered: Solar panel on top of the device that recharges the batteries conveniently. 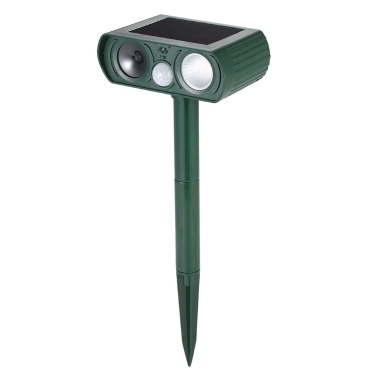 Great for Outdoor Use: Great protection for your garden, lawn, shed, farm, barn, patio or wherever animal control is needed.